Lily-of-the-Valley (Convallaria majalis) is native to the cool temperate areas of Europe and Asia. There is a small population in the Appalachian Mountains in the United States as well. It is highly fragrant and extremely poisonous. 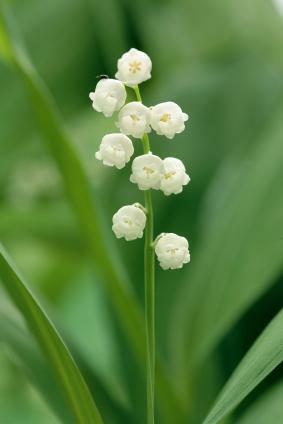 Lily-of-the-Valley is grown for its appearance and ability to cover ground in shady areas. Lily-of-the-Valley has green leaves and white, bell-shaped flowers. Each flowering plant has two leaves with five to 15 bell-shaped flowers on a stalk between the leaves. 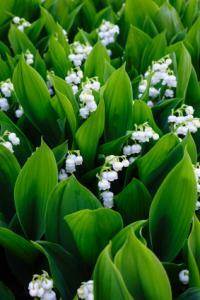 Lily-of-the-Valley is not difficult to grow. It is hardy in zones 2-7 in the United States. Simply follow these steps to have beautiful, sweetly-smelling blooms each spring and interesting foliage from the spring to the fall. Lily-of-the-Valley does best in partial shade. Find a shady spot that is well-drained, and till the soil to a depth of six inches. Add three inches of compost to the soil, and till that in. Now you are ready to plant. Before planting, soak the roots for two hours in lukewarm water. Then snip off the last inch of the roots. Now plant your roots one and one-half inches apart so that just the tip of the bulb sticks out. Water the roots in. Lily-of-the-Valley is easy to care for throughout the year. You will need to water it one inch every week year-round to make sure it gets enough water. Fertilize with a balanced fertilizer such as 10-10-10. Mulch to conserve water and keep the soil temperature down. Spread a layer of compost around the plants to keep the soil fertile for them. Divide clumps, and replant the roots four-inches apart. They will fill in during the year. Lily-of-the-Valley is a perennial that is used to brighten flower beds and is used in shade gardens to provide colorful flowers. Lily-of-the-Valley is generally healthy. Fungal spot may occasionally appear. If it does, cut the effected leaf down to the ground, and destroy the cut leaf. Weevils sometimes take bites out of the leaves, but are considered a negligible pest. Lily-of-the-Valley is a beautiful perennial flower. It can become invasive, however, so it needs to be planted somewhere where it cannot spread and take over the flower bed. Lily-of-the-Valley is the only species in the genus Convallaria, and there are no closely-related plants. It is often planted in shade gardens with hostas, ferns, and other shade-loving plants. The cultivation of this beautiful plant will bring you lovely, fragrant, bell-shaped flowers in the spring and nice green foliage from spring to fall. In the fall, leaves turn yellow and the stalk produces beautiful orange berries. Lily-of-the-Valley delivers three seasons of beauty.